» Social riding: Group cycling in South LA Ride South L.A.
Los Angeles is a large urban sprawl, which means that riding in large groups is more than possible in the city’s large multi-lane streets. The idea of the group ride is at the heart of our overarching efforts to encourage participation, awareness and action. Rather than experiencing the city in solitude, the group ride is a way to meet new people, learn new things and explore new places. With this, we hope to provide fun outlet for local residents to become storytellers, photographers and urban mappers. By working with our partners, we were able to coordinate group exploratory rides through South LA. 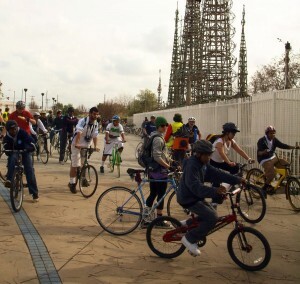 Rolling deep in South LA is something we welcome everybody to be a part of–grab your bike, and join us! Because the city of Los Angeles is a large urban space, biking in such a space requires a little extra preparation. Group rides are a good way for beginners to become familiar with city streets and biking techniques. 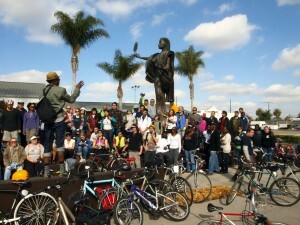 Cyclists Inciting Change thru Live Exchange (C.I.C.L.E.) is a nonprofit organization based in Los Angeles working to promote the bicycle as a viable, healthy, and sustainable transportation choice. Find group rides, meetups and cycling events in their Calendar section. Streetsblog is a daily news source connecting people to information about sustainable transportation and livable communities. Their calendar section maintains a collection of local events and rides.